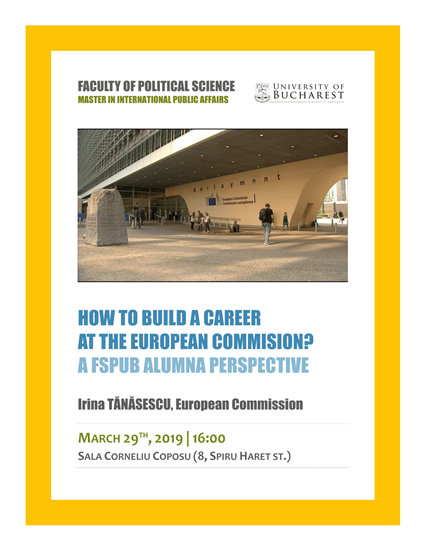 Irina TĂNĂSESCU graduated in 2002 from the Faculty of Political Science of the University of Bucharest, and then completed an MA in Liberal Studies at Dartmouth College (USA) and a PhD in Political Science at the Free University of Brussels (VUB). At the European Commission (EC) since 2007, she is currently part of the Institutional Affairs Unit of the EC Secretariat General where she works on the horizontal coordination of regulatory measures (delegated and implementing acts), as well as on relations with civil society organisations. Irina has also been teaching advanced Master courses at the VUB, she is regularly invited to lecture on EU decision-making to various audiences and has published valuable research for EU scholarship and practitioners, most notably the volume The European Commission and interest groups: Towards a deliberative interpretation of stakeholder involvement in EU policy-making (VUB University Press, 2009). The event takes place in English and it was designed for students of the MIPA program. FSPUB students specializing in EU affairs outside the MIPA program may also attend.